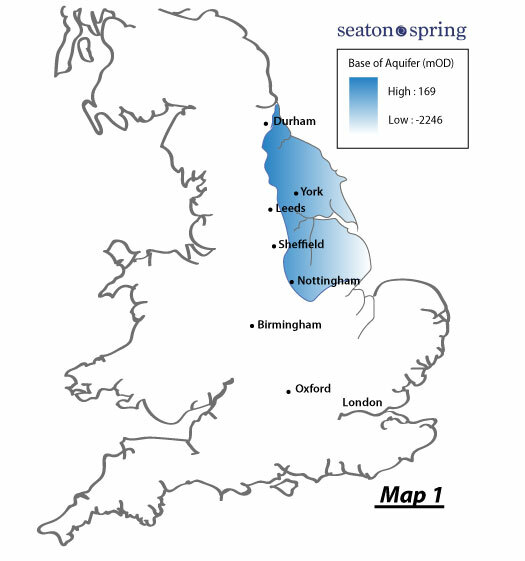 Seaton Spring water is drawn from the Magnesium Limestone aquifer which runs from north east and eastern England east of the Pennines from near Durham down to Nottinghamshire and Lincolnshire with the base of the aquifer being significantly near the surface in the eastern part of County Durham (see map 1). The Magnesian Limestone was deposited during the Permian, approximately 255 million years ago, when the area was on the margins of a shallow sea, known as the Zechstein Sea, which then covered much of northern Europe. The Permian climate was hot and arid, similar to the modern-day Sahara, and beneath the Magnesian Limestone lie yellow desert sands (quarried in places such as Sherburn Hill). As sea levels rose, the Permian deserts were inundated. Initially the Marl Slate, rich in fish fossils, was deposited and then the thick sequence of Magnesian Limestone. Magnesian Limestones of Permian age which underlay the area are a complex succession of calcium and magnesium carbonates with important fossil reef structures which developed around the margins of the Zechstein Sea. The Permian Magnesian Limestone overlies Carboniferous Coal Measures rocks (around 310 million years old). Glaciations shaped the landscape into the one we see today. The last, late Devensian, glaciation 26,000 to 10,000 years ago removed nearly all evidence of earlier glaciations and scraped bare the western Magnesian Limestone escarpment. The ice sheet deposited layers of till (boulder clay) across the area, burying earlier river valleys. When the 500-metre-thick ice sheet melted new valleys were cut, including the Wear gorge at Sunderland and the denes that run down to the Durham coast. Tundra vegetation, of grasses, sedges, club mosses and herbaceous plants, gradually became established on the barren glacial landscape and was followed by an expansion of mixed deciduous woodland as the climate warmed. The sea level rose as the ice sheets melted, eroding the cliffs that now form the Durham coast. The coastal exposures reveal the most complete succession of Magnesian Limestone in the British Isles and are of international importance. Today, the Durham Magnesian Limestone Plateau within which our source is located is an open, agricultural landscape with sharply defined boundaries in the form of a steep limestone escarpment to the west and a dramatic coast of limestone cliffs, headlands and bays to the east. The River Wear cuts across the north of the area, flowing into the sea at Sunderland, and the River Skerne drains into the Tees Lowlands to the south. 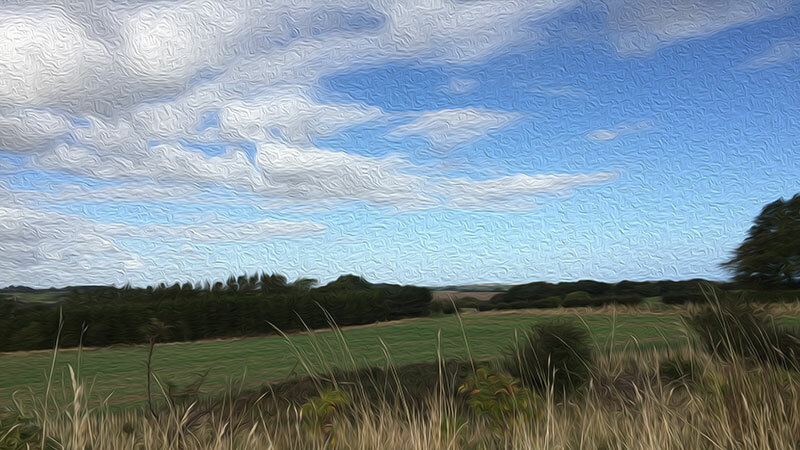 Rural land cover consists of arable land and grazing pasture, with small, isolated areas of wildlife-rich habitat such as Magnesian Limestone grassland and ancient woodland in the narrow valleys (or denes) running down to the coast. The coast is an important breeding and feeding area for migratory birds. Paul has had a varied working life; he spent the 1980’s in the British Army, graduating through Sandhurst and leaving in 1989 in the rank of Captain. Throughout the 1990’s he had a number of commercial positions in businesses as diverse at IT, arboriculture and furniture manufacture. In the late 1990’s he managed both Northumbrian Spring in Darlington and Fresh and Cool Watertechnology, Germany’s largest Watercooler business. Both businesses were acquired by Danone in the early 2000’s. Subsequently Paul joined Seaton Spring in 2005 in which he is now a principal shareholder. A sport and exercise fanatic Paul graduated in 2015 with a 1st class Honours degree in Sport and Exercise from Teesside University. Paul is currently devising a Work Place wellbeing initiative (watch this space) and regularly presents at academic conferences on topics as diverse as the 1948 Olympics and North East football fanzine comic characters. 0 Comments on "Water Coolers With A Difference"